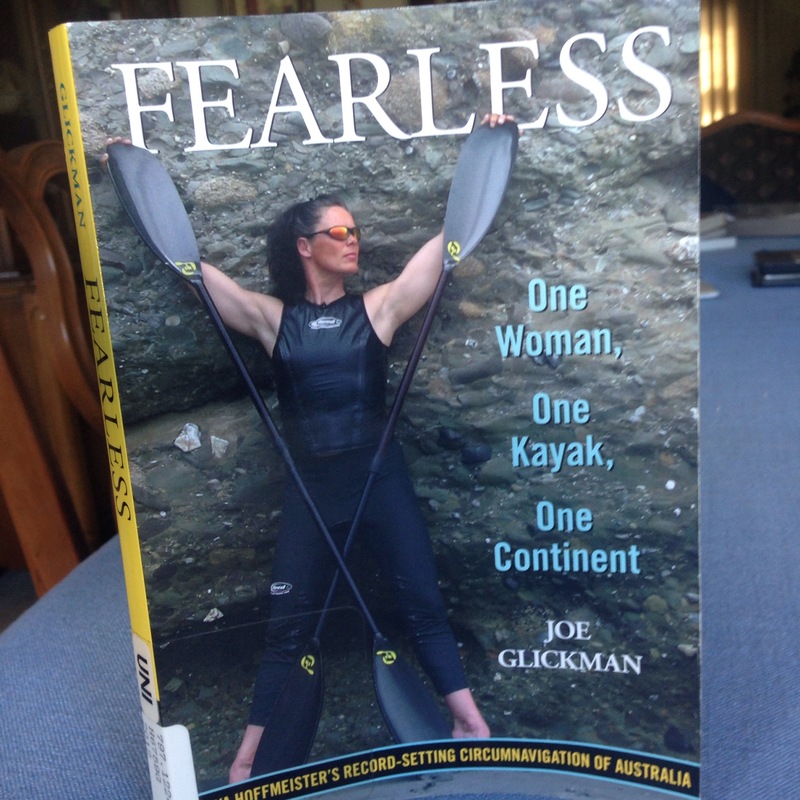 I got “Fearless: One Woman, One Kayak, One Continent” by Joe Glickman from the library. I read all 185 pages in one day (a day including church, a Seahawks away game, and a walk around Green Lake). The story of Freya Hoffmeister is not for the faint of heart, even to read. Her fearlessness is both brash and fascinating. Freya lives up to her Goddess name while circumnavigating the perilous continent of Australia in less than one year. To summarize: as long as you’re not offended by audacity I recommend this book as a compelling story that can’t be made up. Enjoy her perils from the safety of your living room, knowing she’s as calm as if she were sitting right next to you. Can she do what everyone says she can’t do and not only circumnavigate Australia, without a support boat, faster than the only other person (a male) who did it? Can she find true love…on a solo journey? Will she get eaten by a croc or great white shark, drown in the large waves, be smashed into the cliffs, or just become so tired she can’t go on? The book format is easily digestible, with short sections and a narrative view, with snippets of other characters and information. The author established she is fearless right at the start, with her gymnastics, hunting, pageantry (she also has the goal of being the sexiest kayaker), body building, skydiving, and of course kayaking. Not just brave in doing those activities, but doing them with a fearless attitude, where normal person would get scared FOR her just hearing about it. Freya is someone I can admire for her accomplishments, while knowing we probably wouldn’t make good friends. Her lack of fear also comes across as a lack of caring about others (though you find out through the book that’s not entirely true). Her attitude and people’s reaction to her remind me of Hope Solo, one of the most famous women’s professional soccer player, best goalie, and current Seattle Reign player. Hope Solo is the best at what she does and makes no apologies for it. She also socially gets into trouble, and may put herself in bad situations, but most of her bad rep comes from our cultural reaction to audacity and pride from a woman. When a male sports star (*cough* Richard Sherman *cough*) shows his pride we might roll our eyes but most don’t hate him and some find his attitude appealing. And, as a chicken versus egg situation, what sort of personality does it take to become world class and achieve the impossible? Should someone act humble if they’re actually better than us? Not at everything. If Freya claimed to be the most nurturing girlfriend/mother/sister that would be one thing, but she’s claiming that extremely difficult paddles are easy for her, because they are. To quote the brain book I promised before I wouldn’t review: “…people with relatively few pathways from their amygdala, the area deep in the brain that generates fear, to their prefrontal cortex are likely to be less nervous than people whose neural wiring allows their forebrain to be deluged by doom alerts from the amygdala” (The Human Brain Book by Rita Carter, pg. 74). This book is about Freya primarily but we get to learn more about current and past seamen. Short snippets that give us context to just how amazing her adventure is, instead of the stroll in the park she sometimes makes it out to be. We also learn more about the author himself, which struck me as egotistical of him at first (this book isn’t about you!) until realizing I trusted his account more because he’s an adventurer himself. If this were an autobiography it would have been interesting but not as well told, because Freya does not seem interested in the history of herself or the Australian geography and would not even talk about the (high) chance of failure. One of my favorite points the book made was that YOU set the rules of your adventure. If your goal is to be the fastest, or first woman, or lowest tech, or without help, that’s fine! You can be the fastest and not do everything yourself. Or for me, I don’t have to circumnavigate Australia, or even San Juan Island, to feel successful, when my goal was certain paddle routes exploring certain sites (for now!). Her blog is in German but that doesn’t stop me from looking at some of her thousands of pictures! This is especially fun after reading the book, because although there are about 20 pictures in the book you can go online to the Australia sections and find so many more, including a beached ocean sunfish, sea snakes, whales, turtles, seals, sharks, crocs!, and lots of beautiful views! Just keep in mind she is not shy but also knows how to carefully cover up for the camera. It appears she just went around South America as well. Read this book to experience an amazing adventure. ← Library Card = Upcoming book reviews!